Another blast from the post-injury ‘go slow’ phase. This is Vogue 9251, view A. They say not to wear wrap dresses on windy days but I did. These were taken in my lunchbreak (my workplace is about 200m away from this spot) and it was ridicolously windy. So the dress in turn clings and blows out in these photos – sorry but at least they are ‘real life’ photos! Vogue 9251 – taken on a windy day! I’ve made this as a work dress but I do really love the style and considering a floral maxi as a casual dress. I love wrap dresses in summer. Easy care and easy to wear. I made view A with the flutter sleeves and shortened it by 2 inches. I used purchased bias tape on the neckline, to hem the sleeves and skirt. Depending on the fabric weight, I sometimes find this makes for a much neater and flatter finish. 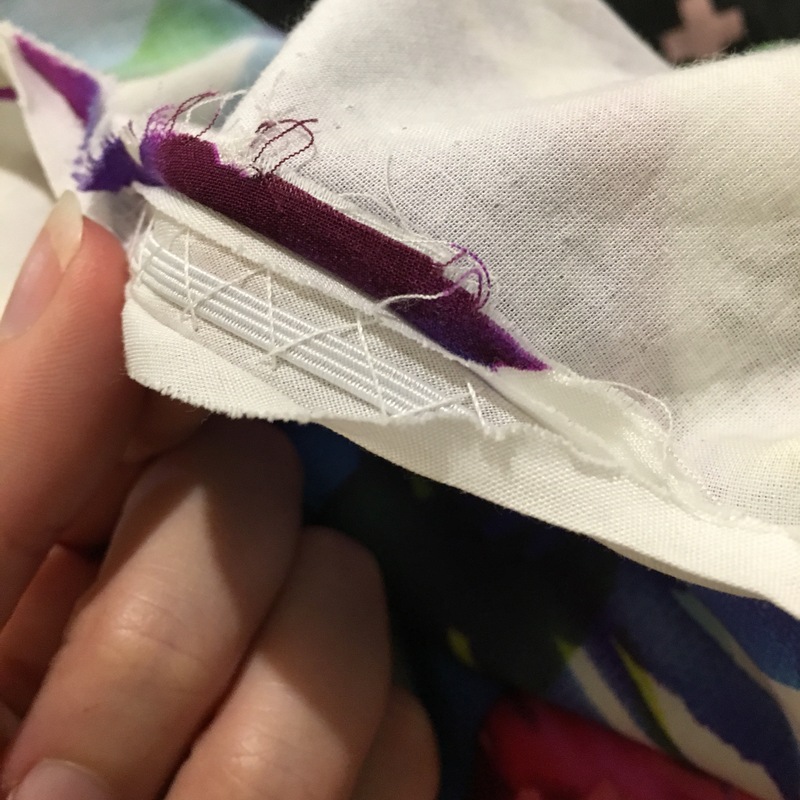 I used my Prym Turning Set to turn the ties… these make turning your narrow fabric tubes SO much easier! I love the sleeves but do dislike how you can see the wrong side of the fabric and the sleeve hems, likewise with the skirt… but the dress is lovely and I can live with that. My fault for not choosing a fabric with a less obvious right/wrong side. In these photos there is a wrinkle at the shoulder – which is not there when I’m looking in the mirror… the risks of walking and moving your arms I guess! I think I need another of these… lovely pattern. It is slightly big, despite making the smallest size available, I wish I could pull it in that little bit more. I might try raising the neckline a tiny bit. The skirt is a generous wrap and reasonably ‘breeze friendly’. Fabric: woven Italian viscose crepe ‘Star Gazer’ from Ruche Fabric. Seriously lovely stuff, doesn’t crease badly and is lovely to wear. Purchased on holiday in January. I’m doing OK. Not much to say about anything as my lifestyle is fairly restricted – hopefully things change after my November review. I’m deliberately being conservative as I figure it’s more likely to heal with less drama. I’ve had enough of medical drama for this lifetime. I miss running. However I volunteer every week at Parkrun and am treasurer of a local running club so I’m staying in the mix and praying for a return to the pavement sometime soon.